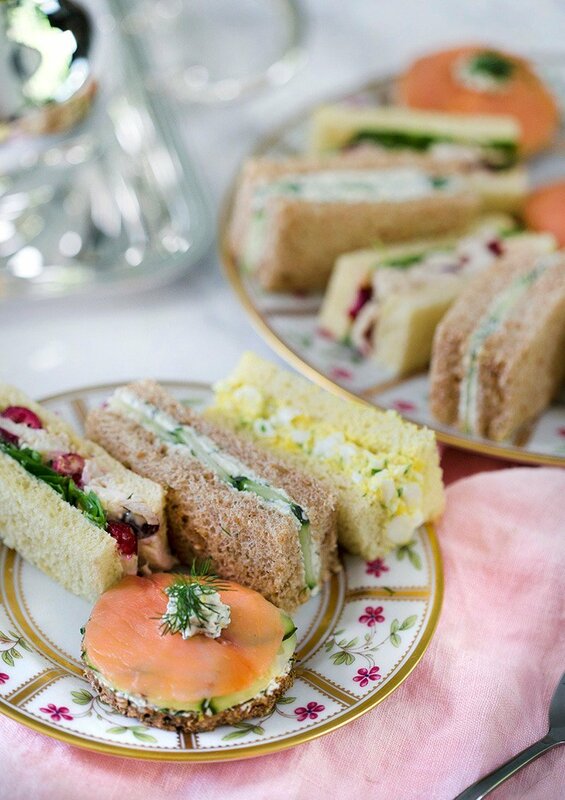 A delicious assortment of traditional English tea sandwiches that will make your heart sing. LOL, well at least you’ll really enjoy your afternoon tea! I included my four favorite recipes in this post; classic egg, smoked salmon, cucumber, and chicken with cranberry! 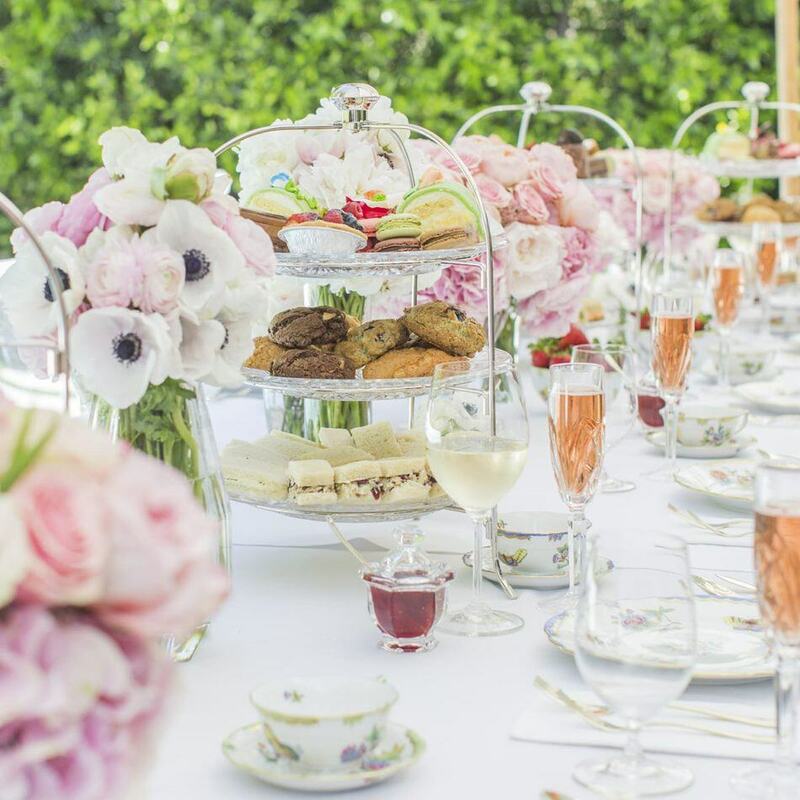 Do you love tea sandwiches as much as I do or is it all about the scones and cakes??? At my house we LOVE a proper tea but are barely leaving the house nowadays as the twins are quite the handful SO I decided to whip up our favorite sandwiches to enjoy with a nice cuppa.😃 I just wish I had another batch of scones so we could have had the full effect!! How do you keep tea sandwiches from drying out? After assemble cover your sandwiches in plastic wrap to prevent them from drying out. Place on your tray JUST before serving as the bread will dry out quickly. What sandwiches are served at afternoon tea? What are tea sandwiches made of? Yea sandwiched have MANY different fillings. What differentiates them from normal sandwiched is their small size and the fine nature of the filling. 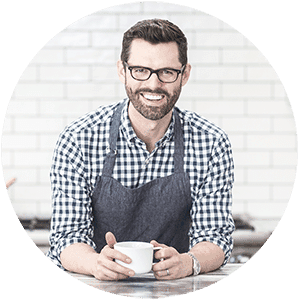 Most fillings are chopped into small pieces so that dainty bites can be taken without having to worry about a giant piece of tomato or chicken sliding out. What is the best bread to use for tea sandwiches? Most of the fillings call for a soft white bread, while stronger flavors like smokes salmon pair nicely with a stronger bread like pumpernickel. Whole wheat bread is perfectly acceptable but the main thing is to use fresh bread, nothing approaching stale. All of these sandwiches will keep for a few hours as long as you cover them so the bread doesn’t dry out. Buttering the insides prevents the filling’s moisture from making the bread soggy. If you want to prepare the egg or chicken fillings day ahead just cover, refrigerate and assemble before serving. I highly recommend using pumpernickel bread for the salmon sandwiches. It perfectly balances the strong flavor of the smoked fish. If you’re feeling a bit intimidated just choose one or two of the sandwiches to serve with some tea and a bit of cake. Your guests will be quite happy with a more relaxed host! Preheat oven to 350 degrees F. Season chicken breasts with olive oil, salt and thyme. Bake for about 30 minutes. Let cool, rip cooked chicken into 1 ½ inch pieces. Mash the cranberries in a bowl. This step is messy! In a bowl, mix together mayonnaise and dijon mustard. Combine cranberries, chicken, mayonnaise mixture until incorporated. Butter sliced white bread bread. Add chicken mixture and a layer of watercress. Cut off the crusts and slice into rectangles. In a bowl, mash hard boiled eggs. Chop watercress. Add butter, mayonnaise, paprika and watercress to a bowl. Mix until combined. Butter bread slices. Add egg mixture. Cut off crusts. Cut rectangles. Cut paper thin slices of cucumber. Chop dill. Combine with softened cream cheese, lemon zest and a pinch of salt. (This mixture will be used again). Spread cream cheese mixture onto white bread and add cucumbers slices. Cut off crusts, then cut rectangles. Spread the same cream cheese mixture from the cucumber dill sandwiches on to pumpernickel bread. Add a layer of cucumbers, then salmon.Cut a circle out of the sandwich. Transfer some of the cream cheese mixture to a piping bag and pipe a dollop. Add a dill sprig for garnish. We loved these sandwiches so much we made them for our sons’ first birthday party which you can see above! And if you’re curious I gotta say my favorite one is the egg although the salmon was VERY CLOSE. Salmon is such a strong flavor if can really overpower the senses so it’s important to pair it with the right bread. Pumpernickel complemented was perfect for this sandwich and the cream cheese dill lemon spread in between really brought it all together nicely. 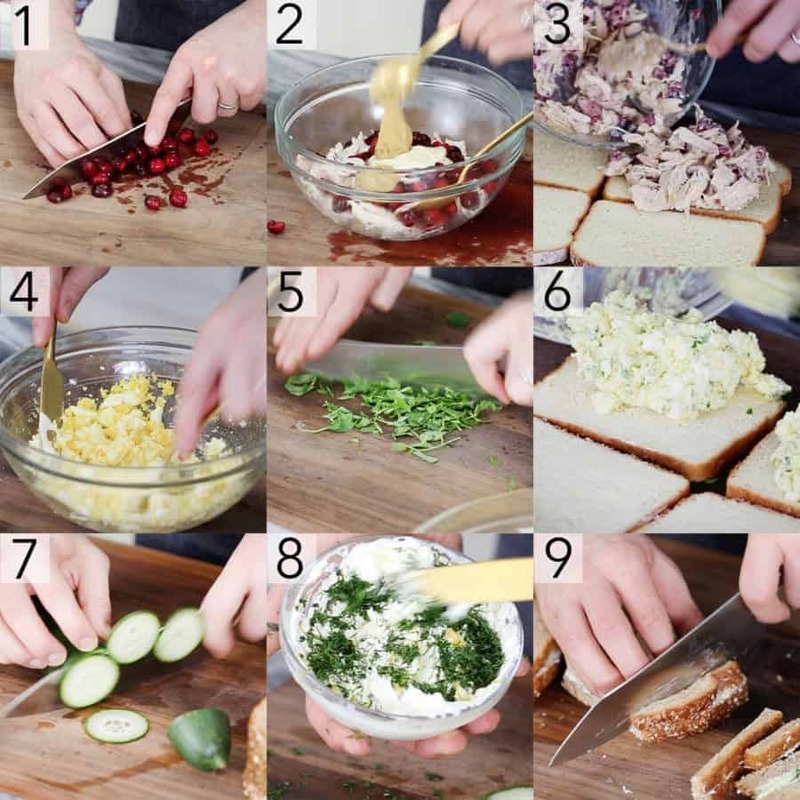 If you’ve tried these sandwiches out then don’t forget to rate the recipe and let me know how you got on in the comments below, I love hearing from you! 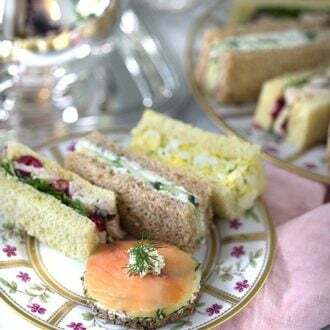 Take tea with these dainty and delicious finger sandwiches! Preheat oven to 350 degrees F. Season chicken breasts with olive oil, salt and thyme. Bake for about 30 minutes. Let cool, rip cooked chicken into 1 ½ inch pieces. Mash the cranberries in a bowl. This step is messy! In a bowl, mix together mayonnaise and dijon mustard. Combine cranberries, chicken, mayonnaise mixture until incorporated. Chop dill. Combine with softened cream cheese, lemon zest and a pinch of salt. (This mixture will be used again). Cut paper thin slices of cucumber. Spread cream cheese mixture onto white bread and add cucumbers slices. Cut off crusts, then cut rectangles. Spread the same cream cheese mixture from the cucumber dill sandwiches on to pumpernickel bread. Cut a circle out of the sandwich. Transfer some of the cream cheese mixture to a piping bag and pipe a dollop. Add a dill sprig for garnish. Add butter, mayonnaise, paprika and watercress to a bowl. Mix until combined. Butter bread slices. Add egg mixture. All of these sandwiches will keep for a few hours as long as you cover them so the bread doesn't dry out. Buttering the insides prevents the filling's moisture from making the bread soggy. If you want to make a full afternoon tea hare are some recipes to try out! The PERFECT sandwiches for tea! I like the salmon the most! Thank you for the tea tutorial. Do you have breads to suggest in the Paleo or gluten free realm? I would suggest checking in the gluten free section of your grocery store! I’m sure you could find some nice substitutes! Hope you enjoy this recipe! Most grocery stores carry gluten-free bread in the freezer and some of the shelves too. Hi John, I’m following you from Cairo, Egypt. Thanks for everything you teach us, it’s all perfect. Thank you very much! I’m so glad you like Preppy Kitchen! What recipes have you tried? England isn’t exactly known for its cuisine, so it’s so nice to see that at least our tea sandwiches are appreciated by someone outside of our tiny island. I tried the chicken and cranberry sandwich, which is a combination I haven’t had before, and I thought it was delicious! They went down well with friends at tea. I’m glad I have your approval on the sandwiches! Thanks so much for the recipes! I’m hoping to make them for a baby shower, but I’m new to the tea sandwich stage. What kind of cranberries do you use in the chicken sandwich? Are they canned? Or are they the fresh ones you can buy in the produce section of the store? Thanks so much for any help! I used fresh cranberries. I hope you enjoy the tea sandwiches, they’re a great idea for a baby shower!